This morning, Town Hall hosted a special presentation by New Jersey Banking & Insurance Commissioner Ken Kobylowski in recognition of April's designation as Financial Literacy Month. 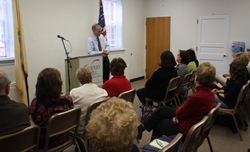 Commissioner Kobylowski spoke to Township seniors for more than an hour about a range of pertinent financial topics, including insurance, common scams targeting seniors, and much, much more. Councilwomen Sara Lipsett, Melinda Kane and Susan Shin-Angulo joined the Commissioner for this special event, along with more than two dozen area seniors. It was an enlightening question-and-answer session, and I want to personally thank the Commissioner for taking time out of his day to help educate our residents about these important issues. We look forward to hosting him again in the future! If you couldn't make today's presentation, please click here for a summary of the topics the Commissioner discussed. For more information or to contact the Department of Banking and Insurance, visit www.dobi.nj.gov, or call (609) 292-7272. Explore a piece of Cherry Hill's history with free, guided tours of historic Barclay Farmstead from noon to 4 p.m. this Sunday, April 6. The Friends of Barclay Farmstead will walk visitors through the19th century Quaker Farmhouse, and will offer visitors a family-friendly craft activity from 1 to 3 p.m. While you're there, explore the Farmstead's beautiful, 32-acre property, which includes historic outbuildings, an apple orchard, a playground, a picnic area and nationally recognized interpretive nature trails. Can't make it this weekend? 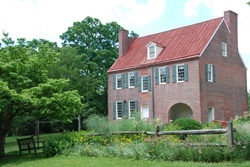 The farmhouse will be open for public tours the first Sunday of every month through November. Tours are free for Cherry Hill residents. For more information, call (856) 795-6225, or email info@barclayfarmstead.org. Be sure to follow @HistoricBarclay on Twitter, and the Barclay Farmstead Museum on Facebook for information on upcoming events and activities throughout the year. The Cherry Hill Department of Engineering will continue road repairs in the Township’s Erlton South neighborhood next week as part of the 2013 Road Maintenance Program. Contractors are set to begin concrete repairs on Park Drive between Cooper Avenue and Route 70 on Monday, April 7, and on Grant Avenue between Route 70 and Jefferson on Wednesday, April 9. Both roads will be open to local traffic and emergency vehicles only during construction. Additionally, the department will begin a sanitary sewer line replacement on Ivy Lane between Knollwood Drive and Lantern Lane on Wednesday. Ivy Lane will be closed to through-traffic during this work. All work is weather-permitting. Residents with questions or concerns either of these projects should contact the Department of Engineering at (856) 424-3203. On Wednesday afternoon, I had the pleasure of meeting with members of the Cherry Hill Religious Leaders Coalition during the group's monthly meeting at St. Andrew's United Methodist Church on Route 70. It was my first visit with the group in several months, and our discussion was both lively and engaging -- focusing on a variety of topics, including sustainability, community outreach and local events and activities. The Religious Leaders Coalition is a multi-denominational group of clergy from places of worship across Cherry Hill, and I always enjoy having the opportunity to both find out what's going on in their faith communities, and share with them the latest news and happenings here in Town Hall. I want to thank Deacon Leo McBlain, the group's convener, Pastor Gina Hendrickson from St. Andrew, and the entire group for welcoming me to this month's meeting, and for their open and active discussion with me. I look forward to visiting again soon! The Cherry Hill Arts Advisory Board and the Department of Recreation is pleased to present “The Great Italians,” the next installment in the Township’s Ensemble Concert series, at 3 p.m. Sunday, May 4, at historic Croft Farm. Various artists from the Philadelphia Orchestra, the Ocean City Pops and the Academy of Vocal Arts will perform selections from Puccini, Luciano Pavarotti, Mario Lanza, Frank Sinatra, Dean Martin and others. Part of Art Blooms Week, this promises to be a wonderful concert. Our last event sold out; buy your tickets now to ensure you won’t miss out! Tickets are $15, with discounted pricing available for seniors and students. For tickets, visit the Recreation Department in Town Hall, call (856) 488-7868, or email Arts@chtownship.com. Click here for additional information. For more information on the Arts Advisory Board and a full list of upcoming arts and cultural events, please visit the Arts Board blog at http://cherryhillarts.blogspot.com/. Stop by the Library’s Art Gallery on the Lower Level and meet painter Carol Hess Plimpton and view her exhibition of oil paintings. Carol has been a Cherry Hill resident for over 40 years and has had a lifelong interest in art. Carol studies with Karen Titus Smith at Studio Classroom in Pemberton, NJ and was selected in 2012 to be part of Cherry Hill Township’s Art Blooms Juried Show. Reception is free and open to the public. Cherry Hill Public Library is a registered Table Top Day site! Bring your friends and try out our selection of cult favorite board games like Ticket to Ride, Small World, and Munchkin. Or bring your own games to share with others! We will also have games in the Children's Craft Room on the Upper Level. All ages welcome. No registration required. Now that you know how to create an Excel spreadsheet, learn more about Excel’s features and functions and the usefulness of this software. Gain experience with formatting worksheets, sorting data, freezing rows and columns, and relative and absolute cell addresses. PREREQUISITES: Basic Mouse and Keyboard Skills, Beginner Excel, or equivalent experience. Free computer class, registration required. Click here to register online with your library card number. Don’t have a library card? Call (856) 903-1246. Local artists are invited to take part in the Township's Art Blooms juried art exhibit, April 26 - May 10 at the Croft Farm Arts Center, 100 Bortons Mill Road. This annual event features original two-dimensional works in watercolor, pastels, oils and more. All artwork is available for sale and neither Cherry Hill Township nor the Cherry Hill Arts Board take a commission. This exhibit is open to artists of all ages and abilities. Simply complete the prospectus and bring it along with your works of art to the Croft Farm Arts Center on Wednesday, April 23 between 4 and 7 p.m. There is a $10 per entry (maximum 3 entries) non-refundable jury consideration fee. Artwork will be juried that night and artists will be notified by Friday, April 25 if they are accepted into the show. For more information, call (856) 488-7868 or email Arts@chtownship.com. For more information on Art Blooms or other activities and events planned by the Cherry Hill Arts Advisory Board, click here. This year’s Art Blooms Earth Festival on April 26 will put the focus on recycling for the more than 5,000 South Jersey residents expected to attend. E-waste recycling by e-Force will take place from 10 a.m. to 2 p.m. with a convenient drop-off area along Borton’s Mill Road, leading to the festival site. All materials will be recycled in an environmentally friendly manner; and for security, all media data that is collected will be destroyed. The Earth Festival Recycling Depot, adjacent to the e-waste recycling area at Croft Farm will also have containers for gently-used sneakers; wire hangers; batteries; and plastic shopping bags. 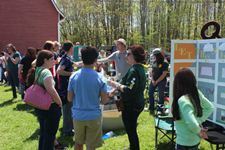 Earth Festival will take place from 10 a.m. to 2 p.m., rain or shine, at historic Croft Farm. Event updates are available at www.sustainablecherryhill.org. The festival is made possible in part by generous presenting sponsors: Hutchinson Plumbing, Heating and Cooling, LourdesCare of Cherry Hill and Ravitz Family Foundation; Leadership sponsors include: Sustainable Camden County, Investors Bank, M. Rosenblatt Roofing and Flaster Greenberg. For more Earth Festival information, contact Brenda Jorett at Brenda@brendajorett.com. The Cherry Hill Police Department is taking part in a nationwide Distracted Driving Enforcement campaign through April 21. This high-visibility initiative, called “UDrive, UText, UPay,” will target motorists who engage in dangerous behavior behind the wheel, including texting and talking on hand-held cell phones. The campaign coincides with April’s National Distracted Driving Awareness Month. I’m pleased to join with the Cherry Hill Police Department in reminding all our residents to make smart decisions when they get behind the wheel of a car. Click here for more information on this campaign. On Tuesday, April 8, Temple Emanuel welcomes Rabbi Marc Schneier and Imam Shamsi Ali, authors of “Sons of Abraham,” for A Candid Conversation about the Issues that Divide and Unite Jews and Muslims. This event is sponsored by the Jewish Catholic Muslim Dialogue of South Jersey and the Jewish Community Relations Council of Southern New Jersey. The program begins at 7 p.m.; tickets are $10 in advance or $15 at the door. Students ages 15 and over are free, as are parents accompanied by a student. For more information or to register, visit www.jcrcsnj.org or call Brandon Cohen at (8560 751-9500, ext. 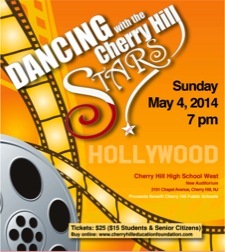 1203.
www.cherryhilleducationfoundation.com or in the Activities Offices at Cherry Hill High School East and West. Online voting for your favorite dancing couple is also available on the Education Foundation’s website. Register now for Camden County’s free Parenting Conference, set for April 12 at Pennsauken High School. This great event features two sessions of interactive workshops, exhibitors, brunch, face painting, balloon animals, fabulous door prizes and more. All attendees will receive two free passes to the Garden State Discovery Museum. Special guests include keynote speaker June Grushka Rosen, a life coach who will talk about how families can coach each other to greatness, and CBS3 Meteorologist Kathy Orr. Click here for the list of workshops and to register. Cherry Hill and Camden County have partnered to once again offer free Chair Yoga classes for Township seniors! These classes are designed to help incorporate yoga into your day, regardless of your experience level. Chair Yoga will take place in the N. John Amato Council Chambers (Room 208) at Town Hall from 1-2 p.m. on April 16, 30 and May 7. An additional date will be added in the future. For more information, call instructor Barbara “Teddy” Piotrowski at (609) 217-4018. To register, call (856) 488-7868, or email Recreation@chtownship.com. Camden County also offers Healthy Cooking Classes, a Spring Fling Senior Dance and other events for seniors throughout the spring. Click here for the full schedule of free events.